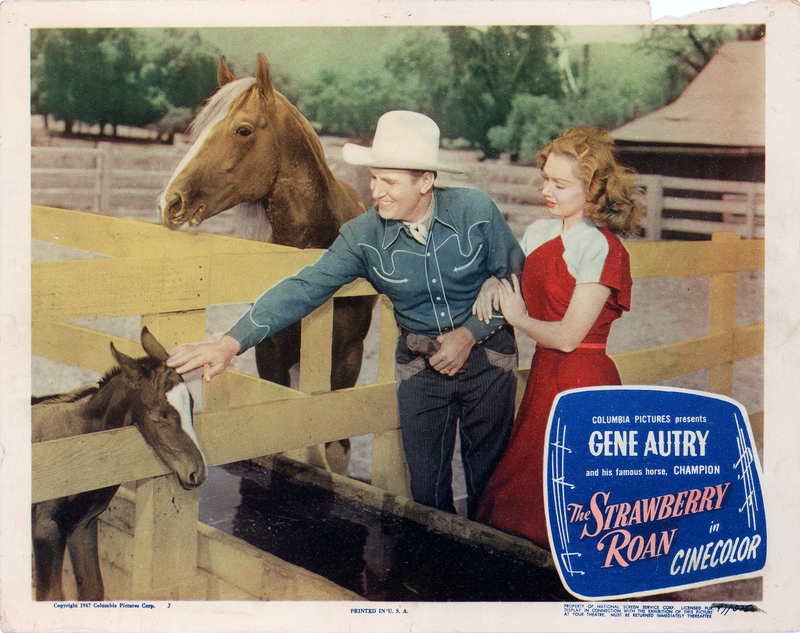 SCVHistory.com LW3004 | Gene Autry | 'The Strawberry Roan' (Columbia Pictures 1948). Lobby card for "The Strawberry Roan" (Columbia Pictures 1948) starring Gene Autry and his horse Champion. The film was released Aug. 1, 1948. "The Strawberry Roan" was filmed at the Andy Jauregui Ranch in Placerita Canyon and elsewhere in the Santa Clarita Valley (and in Sedona, Ariz.). It also features Gloria Henry, Jack Holt, Dickie Jones, Pat Buttram, Rufe Davis, John McGuire, Eddy Waller and Redd Harper, with Sam Flint, Jack Ingram, Ted Mapes and Eddie Parker. LW3004: 9600 dpi jpeg from original lobby card purchased 2017 by Leon Worden.